Layers of painted brick unfurl along the façade of the industrial building that houses Tschabalala Self’s studio in New Haven, Connecticut. Inside, the unmistakable hum of fluorescent lights grows louder as we climb to the fifth floor. 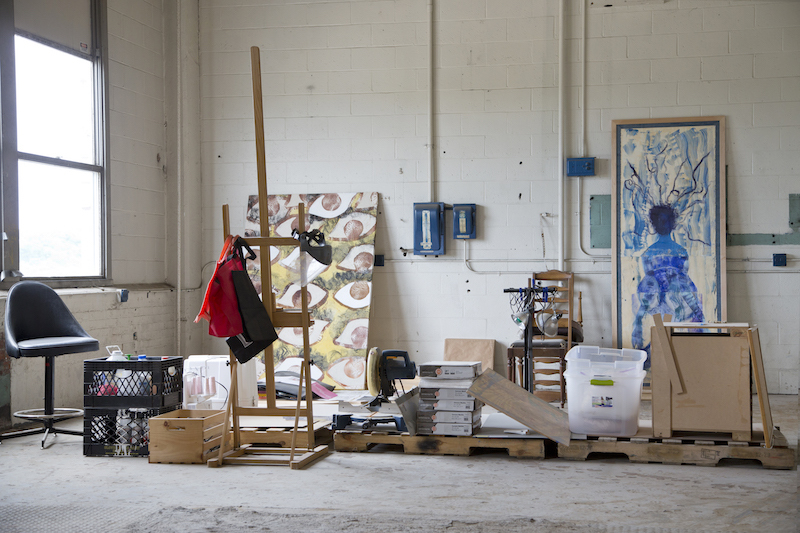 When the artist unlocks her studio door, she reveals enormous windows that dress large canvases with natural light, dissolving the stairwell’s drone. Her studio overlooks evergreen treetops rather than canary taxicabs, its tranquility more reminiscent of the Hudson River Valley, where she spent her undergraduate years at Bard, than of her native New York City. 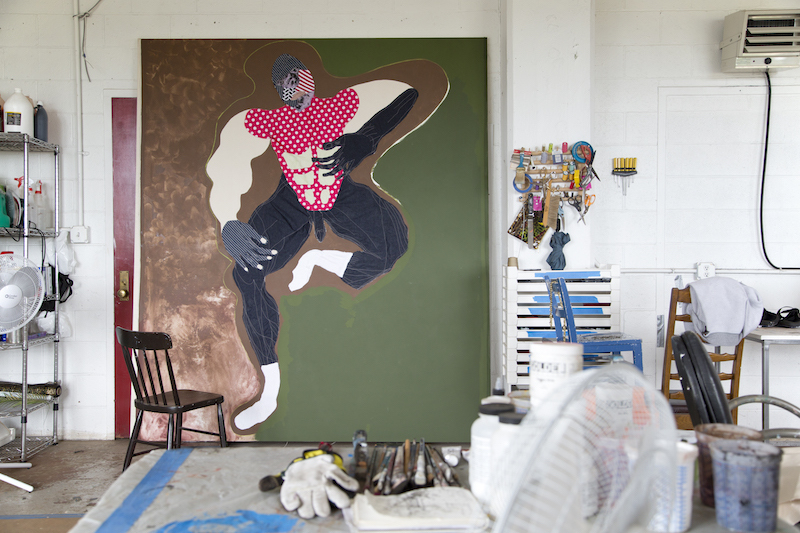 Self’s colossal paintings—often composed with equal patchwork and pigment—posit and probe the iconography of Black bodies. On canvas, her characters inhabit cerebral and urban enclaves to examine interactions “between subjectivity and subjection.” Her sculptural silhouettes of bulbous lower torsos galvanize gallery spaces to confront voyeuristic abjection. Curvy, confident figures create portraiture through not likeness, but earnest animation. 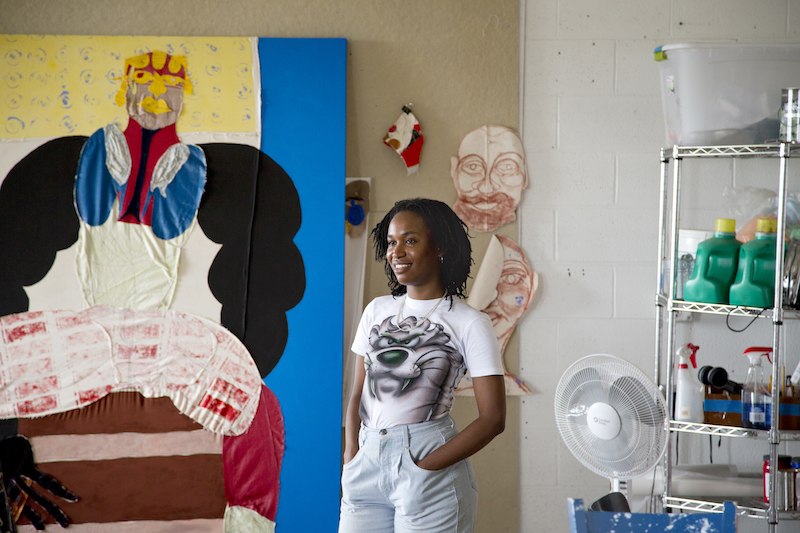 At only 28 years old, the Yale MFA graduate has already launched a successful career and made a memorable name for herself by rewriting the subject matter of art history while outshining its all-stars—at a recent Art Basel Miami, Jeffrey Deitch claimed there was more interest in her work than that of Picasso or Picabia. In what most people would disregard as scraps, Self sees swatches and studies. 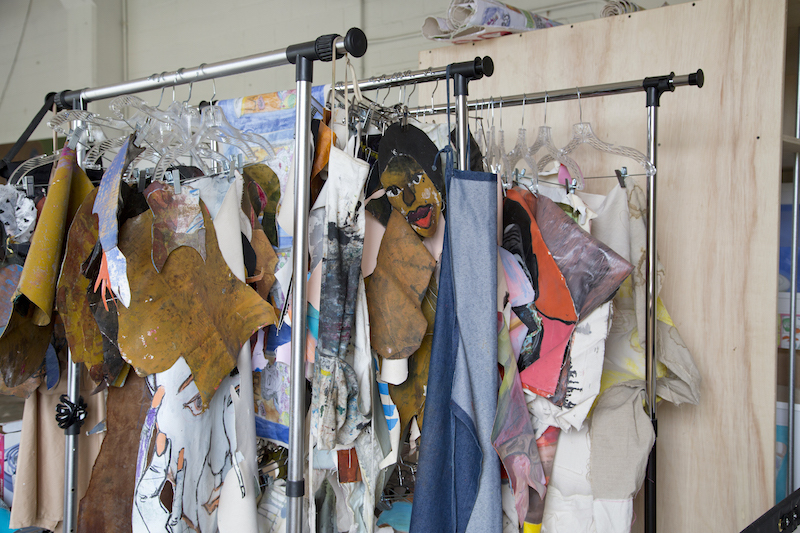 Fragmented fabrics and painted pieces of canvas are strung on clothing hangers; a face peeks out between patterns. Self often returns to this rack to select materials with which to compose new works. The fabrics do not outfit the figures, but rather materialize their flesh, movement and attitudes. 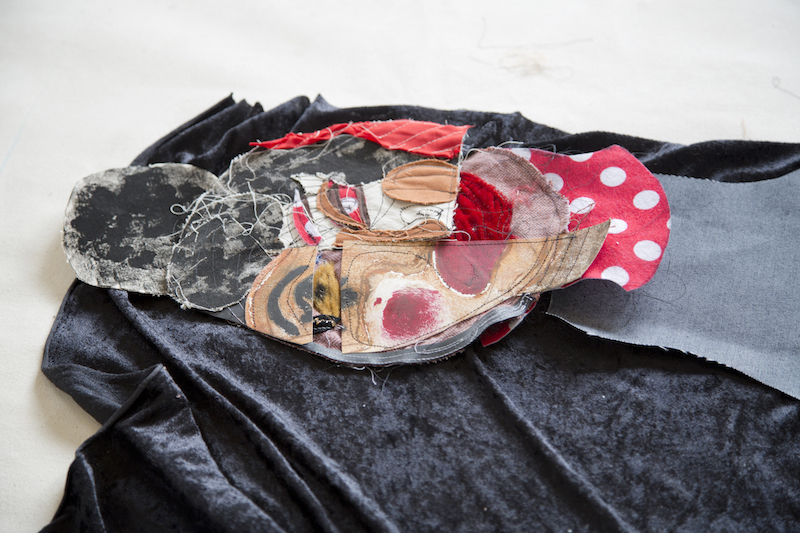 Originally a printmaker, Self unpacked the process to realize what she loved most was building out the plates, now evident in her assemblage of textiles. 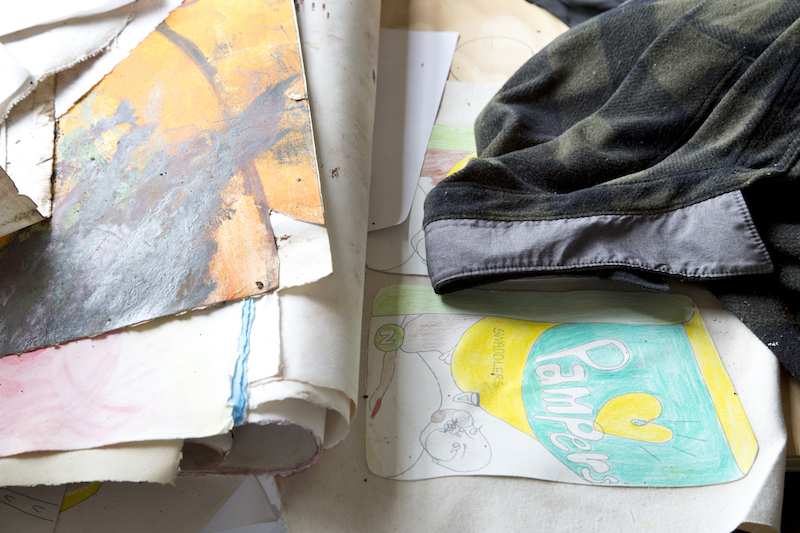 A walk around her studio space divulges a timeline, alluding to her process itself. Materials echo across walls, as the denim of one figure’s resting hand becomes the plump torso of another. “I like when parts of one painting end up in another, because it’s like they’re all related. They share physical traits,” she notes. While she used to refer to her subjects as avatars or stand-ins for herself, she now sees them existing in their own community. Most recently, Self has been working on her bodega series, in which her subjects inhabit the cornerstone stores, replete with regiments of beer bottles and M&Ms, ubiquitous in her youth. “The bodega seemed like the perfect environment for my figures to be in, because it is quotidian, at least for me; it’s a space that visually is part of the landscape and the communities I grew up in and am in now,” she explains. “That kind of space is very iconic to Black metropolitan life and mirrors so many aspects of the lives of the people who utilize it.” In the bodega, originally established by people of color for people of color, she uncovers its duality as a site of stocked goods and socialization. “I feel like the bodega is a metaphor or a doubling for the figures,” she says. As the series has progressed over the last year, the references to bodegas have become less literal in her pioneering visual language that synthesizes commodity and community. Returning to her printmaking roots, Self uses the actual products found in these spaces, stamping candy bars in brick-red paint and twisting can tops around to reveal urban infrastructure. In this sense, the spirit and community of the bodega transcends its interiors; she visualizes the impression that these neighborhood spaces have on their inhabitants, even after they exit. 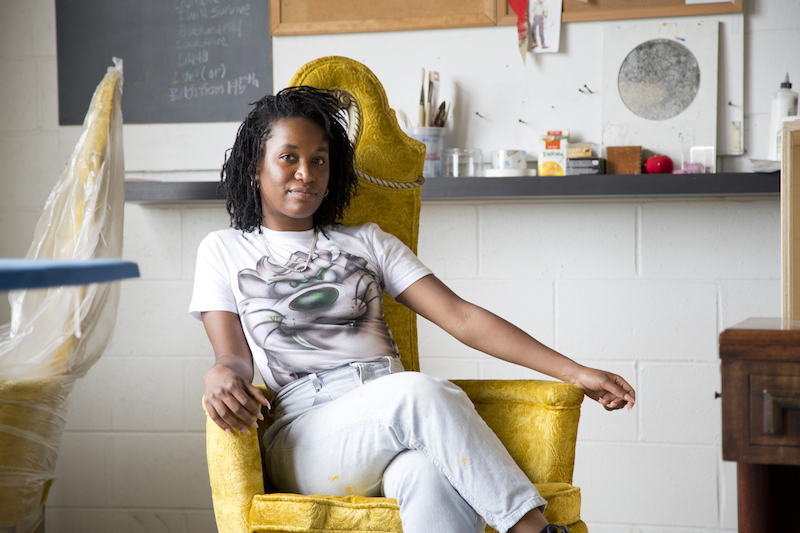 Pinned to her cork board alongside exhibition announcements and photos of friends, a quote from her favorite artist, Kara Walker, stands out: “Rage is fun. / I turn invisible when I turn sideways / I never learn / I am always right.” Self’s rage lies in the layered visibility of the characters she creates in spaces fresh and familiar, averring the vigor and verve of her figures, their communities, and her own artistic triumphs.